We had a Roasted Beet salad recently with our friends Jon and Laura at Bar La Grassa. It had been a few months since we saw these friends and we were missing them! We had a great time. Laura, like Chris, is a great chef. I understand there will be a change to the InnovativeDuo website in the near future. Good luck girls! After we enjoyed a Roasted Beet salad, Chris wanted to make them at home. I love beets so I had no problem having Chris grab some at the grocery store over the weekend. she roasted the Beets in foil on the grill – to keep the heat outside and then left them in the fridge for another day. Wednesday came around, it was pretty hot out but we had some pork chops we wanted to grill. Chris also decided we needed to pair the roasted beets with a the pork chops she was going to grill. Since we were having grilled pork chops with a spicy barbecue sauce, I decided we need to have a nice Zinfandel. It didn’t matter that it was the middle of the week, we deserved the treat! As she was grilling the country style pork chops, I decided to wander down to the cellar and grab a Zinfandel. I knew I wanted a Turley. It’s been a few months since we have enjoyed one and I only had a few left. They are starting to get old. I prefer to have young Zinfandels. I have to say, I do have a 1978 Zinfandel in my cellar from a good friend who lives in Napa. If you need a couple dozen eggs and a “Black Chicken”, you know what I am talking about. I hear its STILL tasting pretty good. 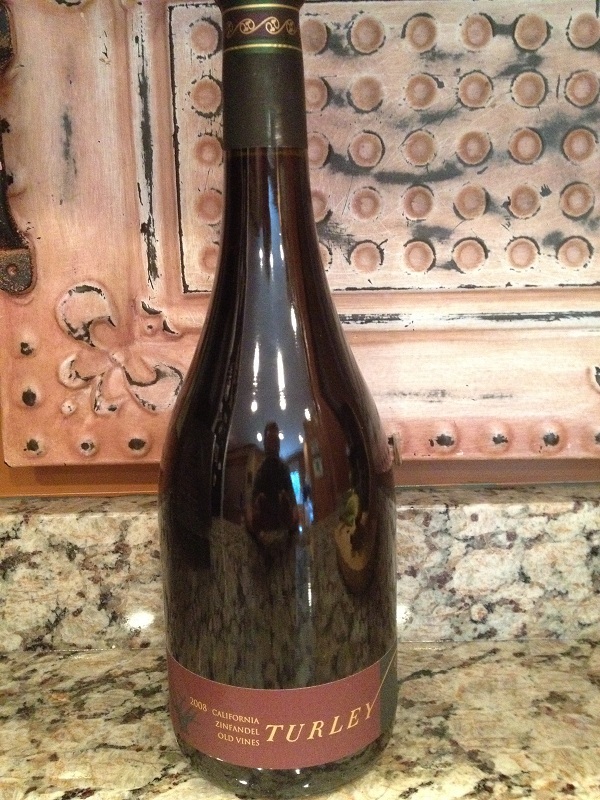 Our friend needs to come visit so we can pull the cork on this one soon! If you are in the Napa or Sonoma valley you will not find a tasting room. Turley has a tasting room down in Templeton California (down by Paso Robles). Chris and I were there a few years back during our kids spring break. We were heading down to Los Angels from San Fransisco to visit some relatives. 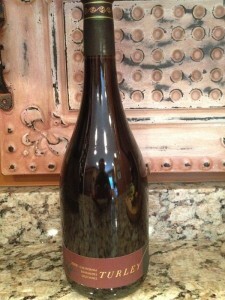 If you are a fan of Zinfandel’s and are in the Templeton area, they are worth checking out! Chris was getting close to finishing up dinner so it was time to open up the bottle and pour us a glass. As she was plating our dinner I decided to make some notes on the 2008 Old Vines Turley Zinfandel. Looking at it in the glasses I noted a medium color depth. The hue was looking purple to me. The Zinfandel was really clear and there was no sediment in the bottle. It was time to give it a “Sniffy Sniff”. The aroma was moderate and not overwhelming. We noted Plums, dark fruit and spices. As we tasted the wine we didn’t find it dry. It was a light to medium bodied wine. I did not notice any real acidity which was nice. 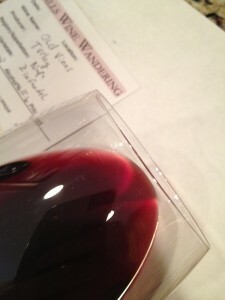 The tannins were soft and the Zinfandel was flavorful. The finish was medium the tannins were felt in my front palate to mid. 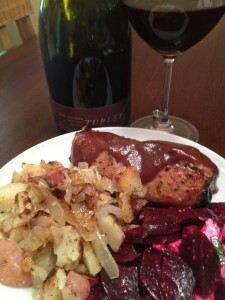 As we ate our amazing dinner, it was clear the Turley Old Vine Zinfandel was a perfect match.